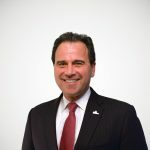 New data from the Organization for Economic Cooperation and Development (OECD) shows that the U.S. corporate tax rate has fallen even further out of step with the rest of the industrialized world as countries such as Canada, the Czech Republic, Korea, and Sweden have cut their corporate rates in 2009, lowering the average statutory corporate tax rate of all OECD nations to 26.5 percent. With a combined federal and state corporate tax rate of 39.1 percent, the U.S. continues to impose the second-highest overall corporate rate among industrialized countries. Only Japan’s 39.5 percent combined rate is higher. As the chart below indicates, the weighted average (accounting for country size) corporate rate of non-U.S. OECD nations is now below 30 percent for the first time in history. 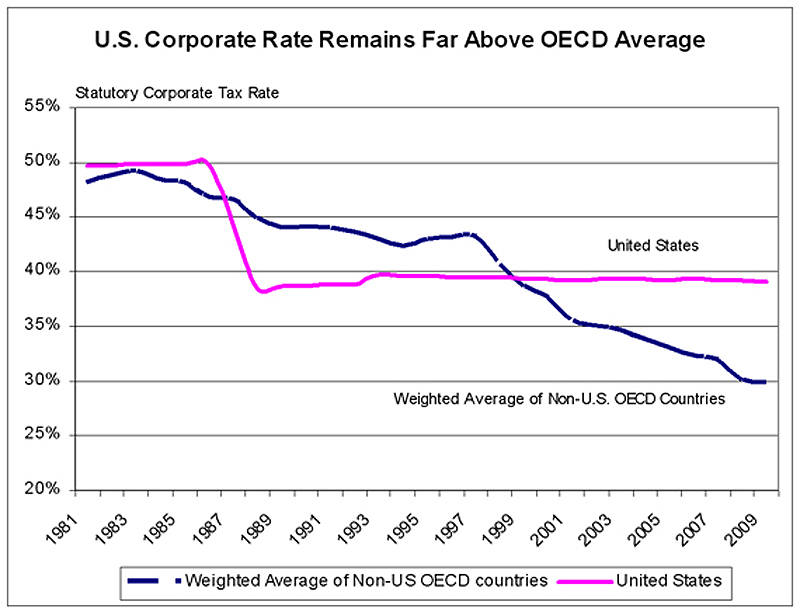 2009 marks the 12th consecutive year in which the average corporate tax rate of non-U.S. OECD nations has been below the U.S. rate. As Table 1 shows, below, Korea enacted the largest rate cut this year of 3.3 percentage points. Meanwhile, Sweden cut its corporate rate 1.7 points and Luxemburg cut its rate 1 point. After the cuts, Korea’s ranking fell to 22nd (down from 16th) and Sweden’s fell to 16th (down from 13th). The United States’ corporate income tax is now roughly 50 percent higher than that of a mid-ranked country such as Sweden. America’s high corporate tax rate should be a red flag to U.S. lawmakers worried about the country’s flagging economic growth, slow wage growth, and overall global competitiveness. An important study released last year by economists at the OECD found that of the various taxes a country can impose, “corporate taxes are the most harmful tax for economic growth.” 1 High personal income taxes were found to be the second most harmful, followed by consumption taxes, with property taxes being the least harmful. Why are corporate income taxes so harmful to economic growth? Simply, corporate taxes have a negative effect on capital accumulation, which can retard productivity, which, in turn, eventually affects GDP per capita. To many “new economy” firms that produce ideas and services, and whose profits are derived from intellectual property and licensing, the statutory tax rate is the effective rate because these firms don’t have large plant and equipment costs to depreciate. They are highly sensitive to the statutory rate and, because they are not capital-intensive, can most easily locate their operations in jurisdictions with the lowest tax rate. Great Britain has found this out the hard way. Last year, Google moved its European operation from London to Switzerland to lower its tax bill and McDonald’s recently announced that it was doing the same. Great Britain’s relatively high corporate tax rate combined with its world-wide tax system has caused an exodus of domestic firms to lower-taxed countries such as Ireland and Switzerland. This forced British lawmakers to reexamine their corporate tax structure and take steps toward a more “territorial” tax system that taxes firms only on the profits earned within the country’s borders. Even Ireland, which has benefited the most from capital flight from high-tax countries, has discovered that it is not immune to capital flight. Earlier this year, Dell announced that it was moving its European operations, and 1,900 jobs, from Ireland to Poland in order to cut its overall costs. Dell had been Ireland’s largest exporter and accounted for 5 percent of the country’s GDP. Great Britain is not the only country to reevaluate the way it taxes business. Recently, Japan also took steps toward changing its corporate tax system to a more territorial system that largely exempts foreign profits from domestic taxation.4 This change was prompted in part by reluctance of Japanese firms doing business in lower-tax countries to repatriate those profits to Japan. In stark contrast to these global trends toward lower corporate tax rates and “territorial” systems that don’t tax foreign profits, the Obama administration is proposing to raise more than $220 billion in new corporate taxes by making the U.S. world-wide tax system tougher. Currently, U.S. companies can defer paying U.S. tax on foreign-earned profits until those profits are returned home. Obama’s plan seeks to expose more of those foreign profits to immediate U.S. tax regardless of whether the firm intends to return those profits to the U.S. or reinvest them abroad. As Great Britain discovered too late, companies that earn more abroad than domestically will take steps to protect those foreign profits from high domestic taxes. Moving to a lower-tax jurisdiction was the method of choice for U.K. firms because companies are as free to move within the European Union as U.S. firms can move between states. After a number of high-profile U.S. firms relocated to low-tax countries during the 1990s, U.S. lawmakers enacted legislation that effectively established an economic “Iron Curtain” around the American border. As a result, the easiest way for an American company to protect its foreign profits from high U.S. taxes is to be taken over by a foreign-owned company. Japan’s move to a territorial system should also be instructive to U.S. lawmakers. A high corporate income tax on repatriated profits acts as a deterrent to reinvesting those profits back home. This of course deprives the domestic economy of needed capital and investment. U.S. lawmakers must take note of these global trends and take steps to make the U.S. corporate tax system competitive with its major trading partners. If they don’t, we risk continuing to fall behind in the global race to attract capital, jobs, and economic growth. 1. Asa Johansson, Christopher Heady, Jens Arnold, Bert Brys and Laura Vartia, “Tax and Economic Growth,” Economics Department Working Paper No. 620. ECO/WKP(2008)28, Organization for Economic Cooperation and Development, July 11, 2008.